I see you come from Blackpool, I love Blackpool, use to go there every year when i lived a bit nearer, I will visit again, perhaps this year. Never seen either of them. 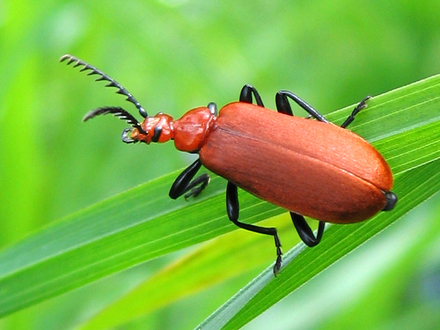 Holleves, The young of the lily Beetle demolishes all the plant, when they have just hatched, If you have lilys look out for what looks like bird droppings, that is the young inside there, get rid of them. Oh thanks from me too Daff, i haven't seen any here yet but keep peering at my lilies every time i go out!!! Thanks for the info and pictures, Daff, very useful. 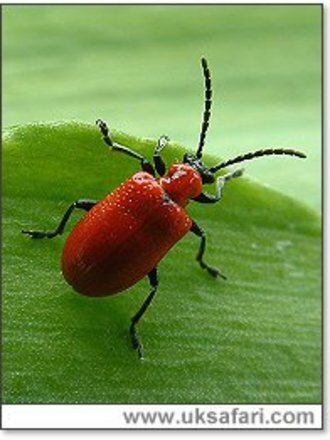 I will go round my garden chanting 'Lily beetle black head', 'Lily beetle black head' to help me remember the difference. don't just check your lilys, look at any plants as you're passing, they breed on other plants, then lay their eggs on the lilys. Tell me about it!!!! I've already(in April0 got loads of larvae on my lily plants as well as the adults which I thought I was keeping down, but obviously not in time! One of my lilies is already ruined! Horrible critters...but thanks for the info, Daff. It's good that you can see the pests, unless they drop of the plant. I don't like using a lot of chemicals, but when i see the larva on the Lily's i do spray, and as you say Spritz, they ruin the Lily's, and to cover themselves in their own ???? is disgusting, they must think that they're safe. I don't spray them, I just take the leaves off (wearing gloves) if they are smothered. Paulthegard, I'm going to spray the lily's before i see anything this time, no matter how many times you get rid of the things, there are always more just waiting for you to go, and then they pounce. Yes, it's amazing to think where they all come from!